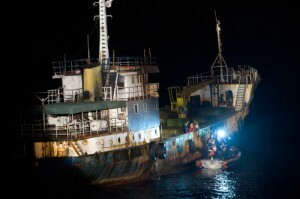 AMLEP in action: A joint U.S. and Sierra Leone law enforcement boarding team talk with the crew of a cargo ship. After a series of high-profile stand-offs with Somali pirates, the international community has directed a great deal of resources toward securing the Gulf of Aden. But with an increase in piracy and other criminal activities in the Niger Delta and the Gulf of Guinea, some of which may be linked to terrorist networks, what role can the Atlantic community play in securing the coasts of West Africa? On the one hand, the United States and European partners are making an important contribution in terms of equipment. In particular, vessels provided through the U.S. military’s Excess Defense Articles system have bolstered the capabilities of naval forces in the region. A recent example is the acquisition by the Nigerian Navy of a former U.S. Navy survey ship and a U.S. Coast Guard cutter, due to be delivered by early 2014. These donated vessels will go a long way to boosting capabilities, especially as at this time the Nigerian Navy is largely dependent on Seaward Defense Boats commissioned from the Indian shipyard Garden Reach Shipbuilders and Engineers. The Indian Navy itself has decommissioned its own complement of Seaward Defense Boats because these vessels generate a disproportionately large maintenance overhead – the materials and method of construction leave the patrol craft with very low corrosion tolerance. More than vessels and equipment, however, the naval forces of West African countries require training assistance. In this area, some training and joint exercises are being conducted by NATO and EU member states, but much of this is carried out on a bilateral, case-by-case basis. In April 2013, French and American military advisors provided training to Liberian Coast Guard personnel, including such topics as non-compliant vessel boarding, search and seizure tactics, weapons familiarization, and hull sweeps for mines and smuggling compartments. All of this mentorship and training was limited to a four-day port visit by a French frigate to Monrovia, the Liberian capital. Other training opportunities take place intermittently. U.S. Naval Forces Africa (NAVAF) has introduced the Africa Partnership Station (APS) program, through which U.S. Navy and Coast Guard crews carry out mentoring initiatives similar to the Monrovia visit described above. The Africa Maritime Law Enforcement Partnership (AMLEP) sees personnel from the U.S. Coast Guard and relevant African institutions operating alongside one another for a slightly more sustained duration. Under this latter program, a U.S. Navy or Coast Guard vessel patrols the territorial waters of the African host country, carrying both an American boarding party and a boarding party from the host country, enhancing that country’s counter-piracy capabilities while also exposing the partner country’s personnel to U.S. Coast Guard best practices. Although AMLEP benefits from a greater duration and depth of interaction, the exchanges are still too brief to develop naval forces that can operate independently in West Africa. More must be done in this area in order to avoid a scenario in which piracy interferes with shipping in the Gulf of Guinea to such an extent that NATO and its partners must field an intervention of the same scale and extent as Operation Ocean Shield, which continues to this day in the Gulf of Aden. To reduce reliance on Ocean Shield, the European Union has since 2012 mounted an ambitious training assistance mission, known as EUCAP NESTOR, with the objective of providing consistent and intensive training assistance to the maritime forces of such countries as Somalia, Djibouti, and Kenya. The mission has 45 full-time staff members working in the countries – primarily Djibouti – and a planned capacity of 137. Begun with a mandate of two years, EUCAP NESTOR could be renewed until these East African states are able to take charge of policing the Gulf of Aden, replacing Ocean Shield. Whereas EUCAP NESTOR was introduced in East Africa as a response to a full-blown crisis of pirate activity, a similar mission could be launched in West Africa as a preventative measure. The lessons that could be provided and the connections that could be forged in a two-year mandate would likely surpass what can be achieved in a four-day port visit. Whether such a training mission would be better carried out under the auspices of the EU or NATO is a matter of political debate. From a practical standpoint, however, committing resources to the sustained development of the Nigerian Navy, the Liberian Coast Guard, and other regional partners would be more cost-effective than the eventual alternative: the deployment of an Ocean Shield-style mission to the Gulf of Guinea. Paul Pryce is a Junior Research Fellow at the Atlantic Council of Canada. Having previously worked with the OSCE Parliamentary Assembly, he has an active interest in both ‘soft’ and ‘hard’ security issues.